I got home Wednesday evening after two weeks in San Jose. Because of the weight and baggage restrictions now in place with the airlines I didn't take any stamping supplies. Now that the mail has been gone through and the laundry complete I'm heading to my haven to play. The Scandinavian Tree card was done before leaving. I wanted to give you a taste of Christmas. 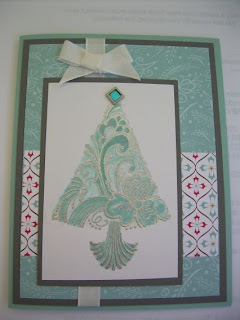 I have a lot of cards ready to show you that I'll be doing in upcoming classes. Check my class schedule and set some time a side to stamp.